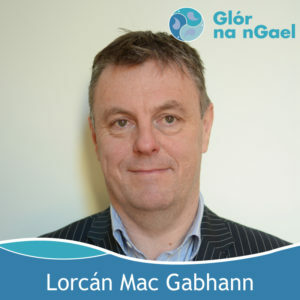 Lorcán Mac Gabhann has been employed as the Head of Glór na nGael since 2001. 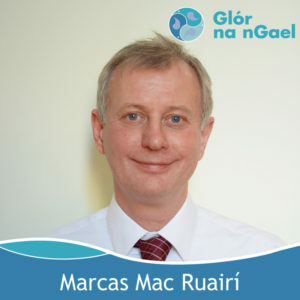 He previously worked with Foras na Gaeilge / Bord na Gaeilge in the Accounts Department and in the Community Development Department. He is past Chair of Gaelscoil Taobh na Coille, Gaelcholáiste an Phiarsaigh, Iontaobhas na Gaelscolaíochta in Belfast and An Foras Patrúnachta. From Downpatrick, Co. Down Marcas Mac Ruairí’s first profession was journalism. 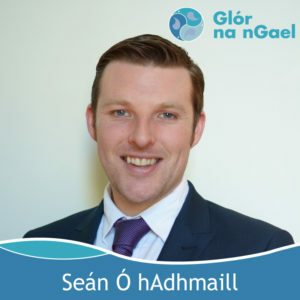 He is now a development manager with Glór na nGael in Dungarvan. He has spent many years working in the Irish language community sector. He assisted in the establishment of a primary school in Downpatrick. Has written four history books and completed a study of the European Charter for Regional and Minority Languages. He has an MA in Modern Irish and is currently studying a Diploma in Language Planning. Eoghan Mac Cormaic is from Derry, but now lives in Galway with his wife and four children. 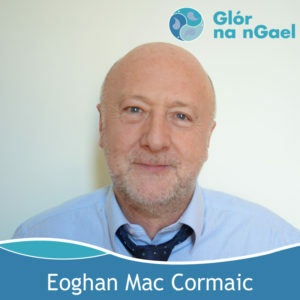 Eoghan has been working with Glór na nGael since 2005 and previously spent five years employed with Gaeilge Locha Riach. Eoghan was appointed to the Board of Foras na Gaeilge in 2006. 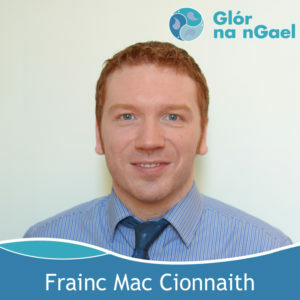 Frainc Mac Cionnaith is from Castlewellan in south Co. Down and now lives in the parish of Kilcoo. He has a degree in An Léann Éireannach from Ulster University. Frainc managed Events & Marketing in Cultúrlann McAdam Ó Fiaich for seven years. He played a role in the promotion of Irish-medium schooling in the north while working as a Development Officer with Comhairle na Gaelscolaíochta and prior to that with the development group in Mhóin na nIonadh, in Co. Derry. 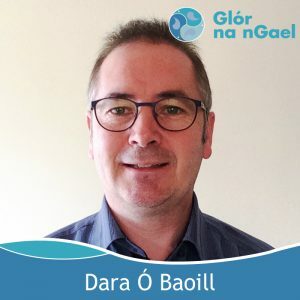 He is a current board member with Glór Uachtar Tíre and previously represented groups including Baile and An Cumann Gaelach at Ulster University. Seán was born and raised through Irish in West Belfast and he now lives in Dublin. Married to Tara, he has four children. He received Irish-medium education from pre-school to university. He has a Master’s Degree in Bilingual Practice, a Bachelor of Science in Finance, Computing and Enterprise, a Diploma in Training & Education and a CIPD Diploma in Human Resources Management. Seán is a CIPD member and has a breadth of experience in the Irish language sector having previously worked with Feachtas, Gaelscoileanna Teo. and Forbairt Naíonraí Teo. 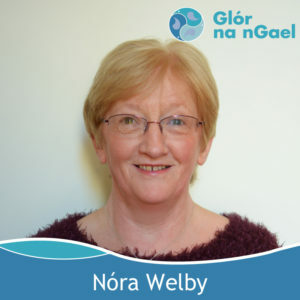 Native Irish speaker, born and raised in Ros Muc, Connemara, Nora Welby received primary education in Ros Muc and secondary level education at Scoil Phobal Charna and also Coláiste Chroí Mhuire, a boarding school in Spiddal. 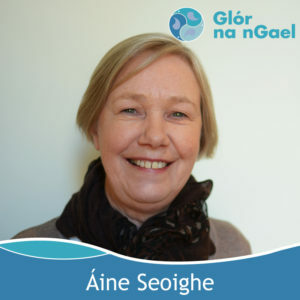 After a course in Office Administration and organisation in Dublin, she worked with Comhdháil Náisiúnta na Gaeilge. 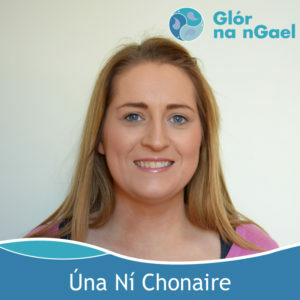 She has worked many years with Glór na nGael and has a broad knowledge and expertise in community work throughout the country. She is a committee member of Coiste Clár na Leabhar Gaeilge. Connemara native Áine Seoighe from Camus, is now living in Dublin. She received her education in Leitir Mucú National School Camus, Scoil Chuimsitheach Chiaráin in Carraroe and National University of Ireland, Galway. 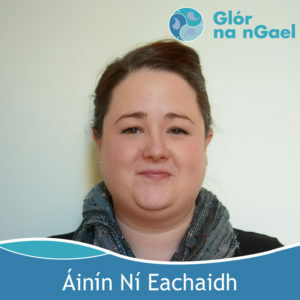 She worked with Foras na Gaeilge as a Community and Business Officer for ten years and is working with Glór na nGael as a Development Officer since 2009. 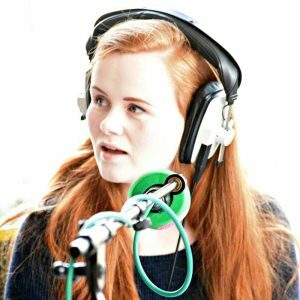 She is a member of Aisteoirí Bulfin, the Irish language drama society based in Dublin. Born and raised in Granemore Co. Armagh Áinín Ní Eachaidh attended St Patrick’s Secondary School in Keady. She has a Bachelor’s Degree and a Masters in Irish and Celtic Studies from Queen’s University and PGCE from Belfast Coláiste Mhuire. She worked five years as a Irish language secondary school teacher and worked for a time as an Irish Development Officer in the Department of Culture, Arts and Leisure. She is interested in reading, fitness classes through Irish and hill walking. She has a Bachelor Degree in Irish and Spanish from NUI Galway and a Masters Degree in Language Planning. She worked with Cultúrlann Uí Chanáin in Derry and with Comhaltas Ceoltóirí Éireann. She has extensive experience in working with youth and is involved in local community development groups in her area. Dublin native, Cabríní lives in Dungarvan, Co. Waterford. She holds a Diploma in Social Work and a Diploma of Higher Education in Applied Social Studies from the University of Huddersfield. 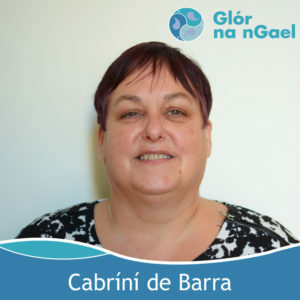 She was an organizer with Coláiste na bhFiann in the past and has experience as a manager of services for people with disabilities in England and Ireland. She was deputy manager of the Kosovar Refugee Programme for Ireland and worked as Language & Development Manager for Gaeltacht na nDéise between 2008-2012. She has a daughter and a son. Nóirín Bairéad is a native of Ballina, Co Mayo. She has a Bachelor’s Degree in Music from UCC and a Post Graduate Degree in Education from UCD. She worked for four years as a secondary school music teacher in both Coláiste Chroí Mhuire, Spiddal and Coláiste Íosagáin in Dublin. She also holds a Masters in Directing for Theatre from UCD and has professional experience in various productions in Dublin. Returning to her native Mayo, she was coordinator of a FETAC course in Performing Arts and facilitator of Mayo Youth Theatre, directing two devised productions in Ballina Arts Centre. 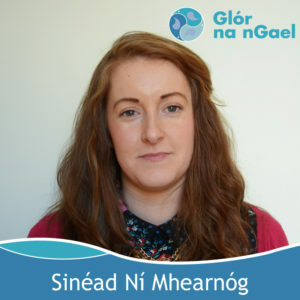 She also worked as Development Officer with Gnó Mhaigh Eo, promoting and developing the Irish language in businesses in Mayo. In her spare time, she loves to read and to keep fit, and is an avid Mayo GAA football supporter. 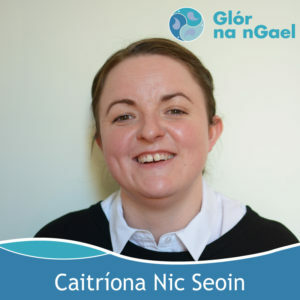 Nóirín thoroughly enjoys living in Dublin and is passionate about her role as Development Officer for the Irish language with Glór na nGael. Caitríona Nic Seoin is from Southwest Co. Donegal Gaeltacht; Gleann Cholm Cille. She attained a Bachelor’s Degree in Irish and Law from the National University of Ireland, Galway and a Masters Degree in Language Planning. 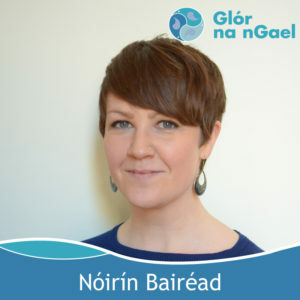 She spent five years as Language Development Officer with Lár Chomhairle Paróiste Ghleann Cholm Cille and two years working with Foras na Gaeilge in Gaoth Dobhair before joining Glór na nGael. She was central in the organisation of Comórtas Peile na Gaeltachta 2008 when she worked as Public Relations Officer & Language Officer with CLG Naomh Columba, having been in the role for seven years. She broadcasts bulletins from her local area for Camchuairt on RTÉ Raidió na Gaeltachta. Dara grew up in Cois Fharraige, in the Conamara Gaeltacht. He was involved with the Youth Club movement in Conamara and he was active in a choir and drama group for a period he spent in North Wales. He spent over eight years working in audio-visual and print companies in Ireland and in France. He spent ten years as a franchised owner/manager of a business in southwest France and set up a local media network to provide a low-cost platform for businesses, institutions, community groups, associations, etc. to give them access to a local and a guaranteed audience. Glór na nGael, Ráth Chairn, Baile Átha Buí.